Another great day in the playground known as Umstead State Park. I decided to hit the trails yesterday. I had about two hours so I chose one of my favorite routes, the Double Company Mill Trail. 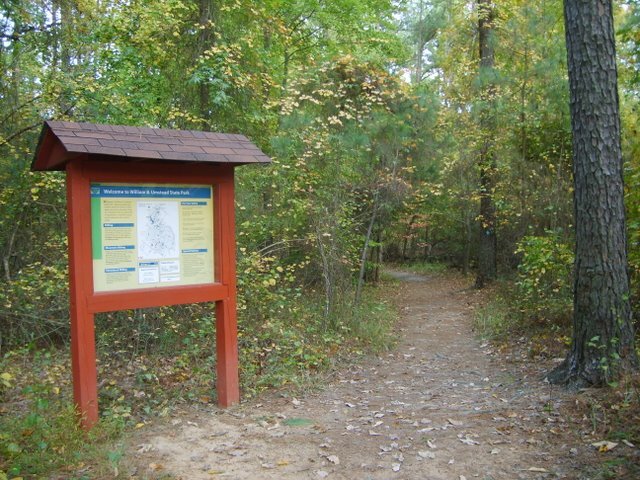 Company Mill is a lollypop trail, an out and back with a loop. When I do the double I run the loop once in each direction before climbing back up the spur for about a 10 mile workout. The weather was once again near perfect, about 59F. One great thing about running on a weekday afternoon is the lack of crowds in the park. And when you are on the trails there are even less as the Mt Bikes are not allowed. This day the trails were practically my own. I only encountered a pair of hikers walking their dog on the first loop and a lone runner on the second. Although I do enjoy running with friends it is these runs that satisfy my soul. Just me alone with my thoughts and God to keep me company. I was feeling very good yesterday and with the cool weather I could just relax and have fun enjoying the sights, sounds and smells of the forest in Autumn. More than once a big smile came across my face as I played in the woods. To top it off, I set a new course PR without even trying. No , the photo isn't Company Mill. 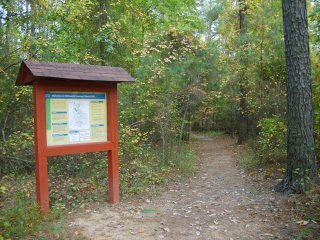 This is the trailhead to the Loblolly Trail.